Still here. Preoccupied with the wedding, some design projects and then the usual business of family, I almost forgot to show you this. Lots of ways to go with this idea. Basic materials already here, but a project like this needs time to become. It needs time to engineer, to dry and to decorate. 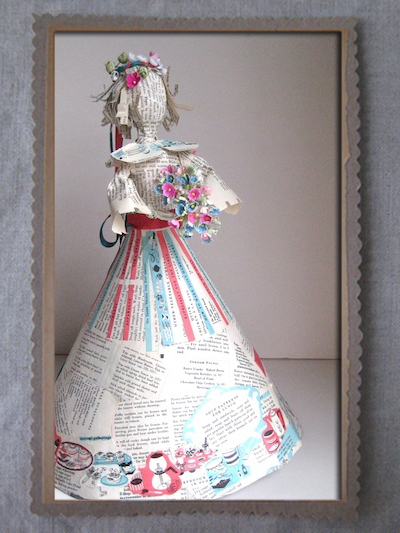 Originally I planned to make a fancy bride with all kinds of ruffled paper and a sweetly painted face a bit like the pinata from Erin's wedding. Maggie requested something simpler. She thinks dolls with faces are creepy. But I think they're creepy without faces. Maggie's party- Maggie's way. The decorating ultimately called for an old cookbook, Mod Podge, a big bottle of wine and a good friend whose clever ideas and laughs inspired the finished frock. And some wild, crazy hair! 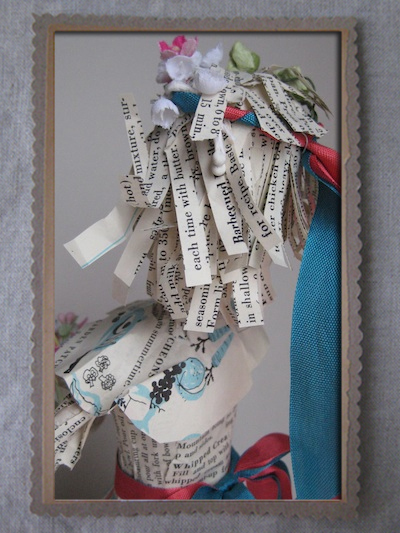 Still not sure if she's cute or "creepy", but no matter what, she was so much fun to make. Next post I'll tell you how I did it.